- Material: Iron, good hardness. - Size:Long arm: 14cmm/5.5" (Including flange and elbow); Short Arm: 8cm/3.1"(Including flange and elbow); Flange Diameter: 6.5cm/2.6". - Perfect for using in bedroom, living room, study room, kitchen, office, cafe, resturant, store, bar, and any other place you want to add some special and chic decoration. - Please allow little dimension error due to manual measurement, and please make sure you do not mind that before you add to cart, thanks for your understanding. - We are committed to committed to providing customer with the best service. - If you have any questions with the purchased item, please contact us. - We will be delighted to solve your problems. - If you are interested in our product, don't hesitate. - Add it to cart now. DURABLE MATERIAL: Our obmwang bracket made of high quality iron material painted with black matt, sturdy and durable, not easy to break. BRACKET SPECIFICATION: Long arm of the bracket measures 14cm/5.5", while short one is 8cm/3.1"(Including the flange and elbow); and the diameter of the flange is 6.5cm/2.6". RETRO DESIGN: The floating bracket with retro design can be good to show your show your distinctive aesthetic and taste. The simple but elegant style makes the brackets a good decoration to your home. WIDE APPLICATION: These brackets work with a plank(Not included) are not only good as storage rack, wall shelf brackets, clothes hanger in your bedroom, living room, study room, but can be also used to display potted plant, photos or other decorations, adding some special and chic decoration to your room. 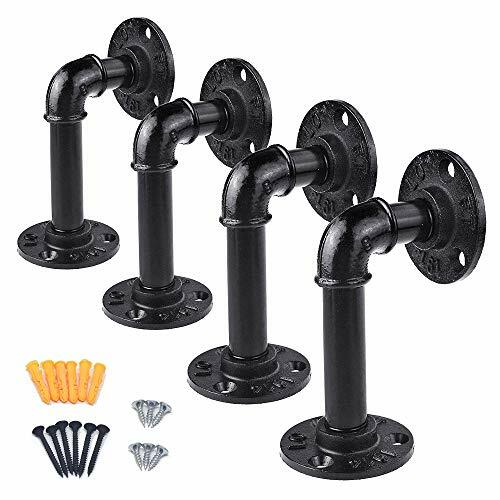 GREAT-VALUE PACK: You will get a package combined with 4x brackets, 12x short screws, 12x long screws and 12x anchors (screw holders) for your convenicet use, please note that the wood plank is not included. If you have any questions about this product by obmwang, contact us by completing and submitting the form below. If you are looking for a specif part number, please include it with your message.